Hungary has become the first European country to join the Chinese 'Silk Road’ project aimed to strengthen ties between Asia and Europe and develop trade and infrastructure in the region. Foreign ministers of China and Hungary signed a memorandum of understanding for the New Silk Road, also known as the "One Belt, One Road" project in Budapest, the Chinese Foreign Ministry said in a statement published on its website late Saturday, Reuters reports. In March, Chinese President Xi Jinping said he hoped the trade among all of the project’s participants would exceed $2.5 trillion in a decade. Hungary hopes to intensify cooperation with China that can speed up the construction of the Hungarian-Serbia railway and other infrastructure projects, said the country’s President Janos Ader, as quoted by the Chinese foreign ministry. 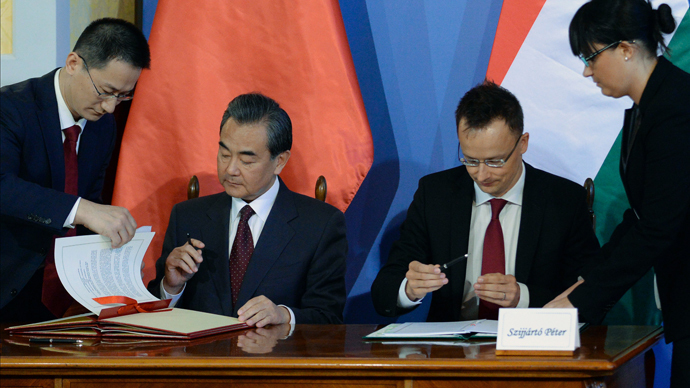 China is involved in financing and constructing a railway between Hungary and Serbia.